Whether you have a new fireplace that needs a mantel or you are replacing the mantel for an existing fireplace, there are so many options to choose from. There are a variety of materials, colors, and styles to consider when choosing your new mantel. However, despite the variety of options, you may not be able to find just the right mantel to meet your needs. You may find a mantel that is very close to what you are looking for, but not quite right, such as you would like a different color. In this case, you can choose a custom mantel to change one or more details to get the right look. You may not find a mantel that has the right combination of features that you want. Different types of stone, various textures, degree of ornate carvings, and colors that range from neutral creams to bolder maroon can all affect the look of your mantel. Decide if you wish your fireplace to be to focal point of your decor or blend in, then make your choices from there. 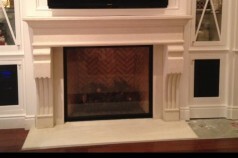 For custom fireplaces in Orange County, SoCal Fireplace Mantels has an experienced design expert available for you to speak with to help you create the mantel that you want. You can choose from a variety of materials, colors, and styles to create the right combination of features to fit in with your individual style to make your fireplace and your room a unique creation.